How long might it take to colonize the solar system - and how to make a mostly educated guess? On one hand, we know that we are yet in the very beginning phase to develop technologies to make life in space sustainable. For example, NASA's recently updated program on ISRU (in-situ i.e. on site resource utilization) has given grants to Blue Origin and others to explore how oxygen and methane could be produced on site for propellant production. To make something actually practically useful, say, providing a constant supply of cells for an expanding space colony, would require at least several decades. But then, there is the hypothesis about exponential pace of technological development, based not just on Moore's law but growing frequency of scientific discoveries and interaction speed. In the extreme case, technological singularity could take place technological singularity, i.e. a tipping point in human history after which we can't predict what happens. From this follows that say a year in future might equal to a decade in the past in terms of technological progress. This appears to me like a contradiction which I am not sure how to handle. My question is how to formalize on this dilemma to make the choice on an argumentative basis or which sources to discussing it, because currently I think of the following and not sure of more solid argumentation beyond pure speculation. Option 1. 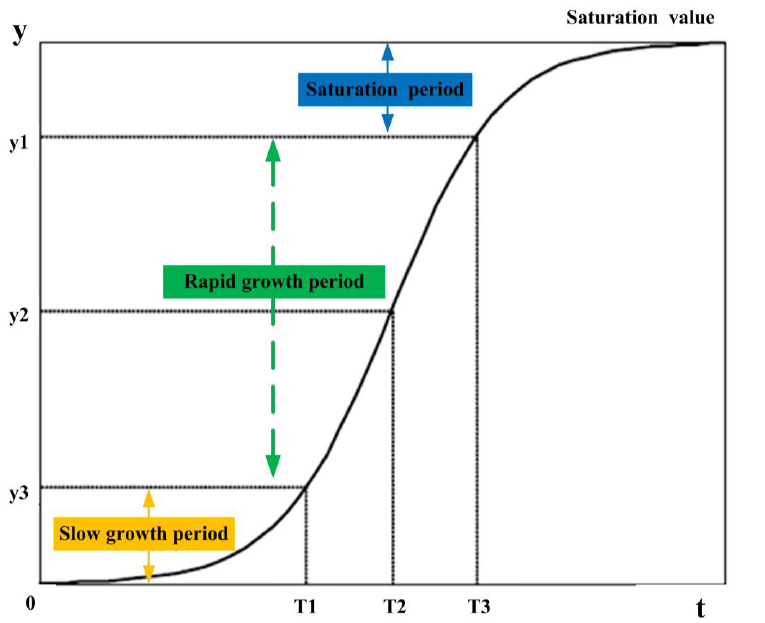 There is no really exponential development proposed by Technical Singularity proponents, either it is stagnating due to limited of researchers and funds, maybe it is kind of pareto principle which will show more and more impact. (see image below from the book Singularity is Near) Note: the plot is a multi-plot from different sources. Option 2. There is indeed exponential development and next years so many breakthroughs will come that what we think are several decades are actually just several years, and according to that interstellar travel could be even possible by 2050 (because, years 2045-2050 are kind of folded equivalent of say 1990-2030 for example). In this case, question is what could be the breakthrough path..
Option 3. As space colonization problem is exponentially complex, "several decades" is a linear timeline development resulting from exponential technology development meeting an exponential problem. UPD I'm quite happy with the answers so far. The bottom line of the answer seems to be "the hypothesis about exponential development is not true because it is just a part of the logistic curve. I think you are extrapolating trends where there is no room for extrapolation. the number of transistors in a dense integrated circuit doubles about every two years. Well, if that was true also for space travel, the trip to the Moon that in 1969 took 3 days it should now take half a minute, which doesn't. And the Apollo program, which costed 25 billion dollars back then, if the prices would have followed the same Moore's law, would cost about the same of a small private plane today. While it is true that in the field of integrated circuits we are following an exponential growth, the same cannot be applied to other fields. I would even say that field is an exception among the other fields, which normally follow the logistic curve when it comes to their development (source of the picture). 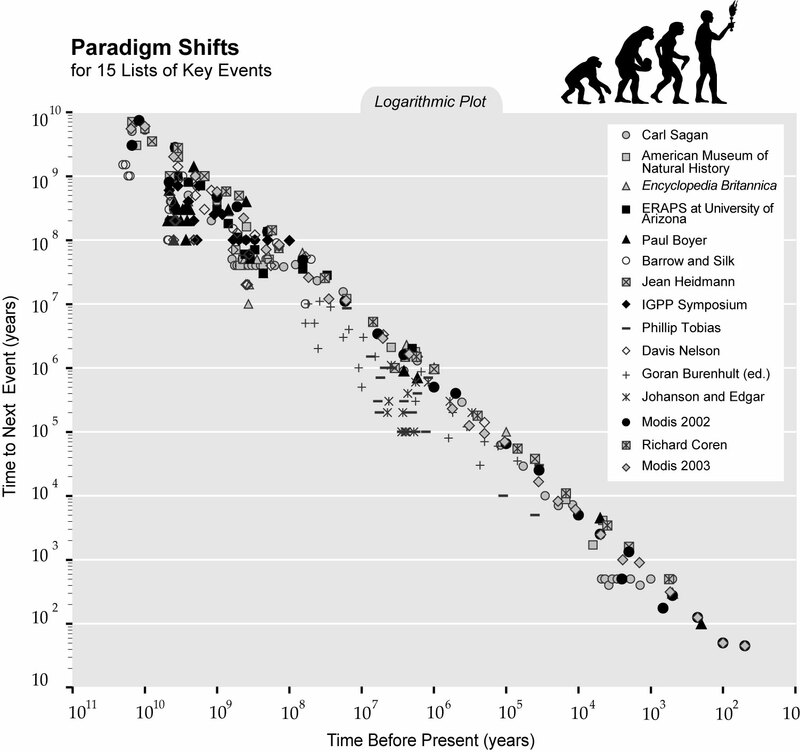 The proponents of the technological singularity base their conclusions on flawed premises, the graph on which the hypothesis is postulated contains a biased selection of important paradigm shifts but most of the so called paradigm shifts before 10e4 years are cosmological, astronomical, geological and biological events and have nothing to do with technological advancement and which can be argued to actually become less eventful as time progresses once the anthropocentric viewpoint is removed (it is us looking backward in time and the further you look back the harder it is to provide solid evidence that an event did indeed occur). If there is anything like exponential growth this is mainly fueled by the continuing exponential growth of the number of humans (but that too will have to stop once the resources to sustain humanity run out). It can be postulated that in a field of technology, progress tends to the follow the logistic curve with a seemingly exponential curve at the beginning which then bogs down as ever increasing perfection becomes more and more costly in terms of effort. War is actually a great way of increasing the funds available for technological advancement and also for paradigm shifts, totally new technologies that change the playing field and allow for other applications and way of thinking about things (e.g. steam engine versus internal combustion engine). Space colonization in its current state needs quite a few of those paradigm shifts. The technology is essentially the same (albeit much improved) as the V2 rocket of WW II Germany. It is insufficient to carry humans or equipment in large numbers to and from space. Long term stay (months to decades) outside the Van Allen belts is another issue (radiation!). Also, we need to do something useful in space, that is, an economic proposition that promises a large return on investment, it may be uncertain at first but it surely needs to be there. Even if we assume the rate at which we can discover knowledge because of technology exponentially grows, you will have several natural bottle necks that will prevent real exponential expansion. Most likely there will be saturation as L. Dutch points out. Here is a long list of all the basic things that can limit exponential growth, though there are many others as well. First. You will run out of people to do the researching. Each human has limits on what they can do, and there are limits on the number of humans that we can have because of resources. You might think, but we can expand to space! But there will be limits there too. How about computers? There are problems with that too. Second, Computing. But computer can get stronger and stronger and solve problems we cant even dream of!? Two problems. The first is that if only the computer knows and understands the discoveries then what use is that to us? You will need computers/robots to replace humans as manufacturers, thinkers, travelers, and eventually everything. That is assuming computers can even grow exponentially. Second, Moore's law is no longer holding up. So another method to improve computing will have to be fund. FYI Quantum computing also has constraints and cant improve forever. Many constraints have already been identified like quantum effects that limit the minimum size of quantum computers. Third, there is a waiting period for new devices to be deployed and created. You might have lots of new knowledge that you want to put to use. But in order to get newer knowledge you need new and ever better equipment with which to observe the universe and get the new data to fuel your exponential growth in research. There are constraints on manufacturing, so if innovation becomes too fast a lot of time will be spent waiting around for things to get built. Fourth, at some point discoveries will be too powerful and the scale will be too big. So your human researchers will have reached the limit of what modern equipment can tell them, and they wont be able to create newer improved equipment. The scale of resources and other requirements will be so large that the discoveries will not be practical. I give you as an example the kugelblitz, aka the black hole star engine. We know that it is theoretically possible, but the amount of energy required to create one is far beyond anything our civilization can create that we can't do anything with that knowledge. It is powerful knowledge, but not practically useful. Not the answer you're looking for? Browse other questions tagged space-travel space-colonization near-future singularity or ask your own question. How to deliver materials necessary for terraforming?